This Diamond Horseshoe Pendant is set with 11, 1.8mm diamonds, but any almost gemstone could be used. It is about 1/2 inches tall by 1/4 inches wide, but could be made tall and/or wider. The stones could also be made smaller or larger as well. ACCENTS: Around 1/4 tcw. They could be Diamond, Gemstone, or CZ. The starting price is for a 14K gold Pendant with SI1-2, HI color diamonds. Please contact us for other options. 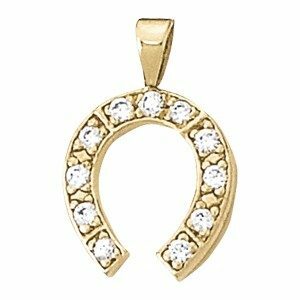 Click HERE to see another Diamond Horseshoe Pendant design.